Of the 55 candidates who ran in the House election yesterday, 7 were women. 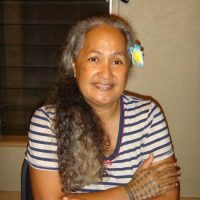 The only female candidate who won a race was Andra Samoa from Fofo District. Samoa, a former CEO of the American Samoa Power Authority has run twice before. The Faasao High School graduate currently serves on the Board of Directors of the American Samoa Telecommunications Authority. She is a part time teacher at St Theresa School and is active in marine preservation, youth and women empowerment programs for Leone village. Samoa acknowledged her predecessor and all those who supported her.